A leading national authority on Asian culture and cuisine, award-winning author, and former food editor for Martha Stewart's Whole Living magazine, Ying Chang Compestine is the multi-talented author of 20 books including fiction, picture books, and five cookbooks. She is the host of the popular TV cooking show New Ideas for Delicious Meals on Phoenix TV, and the spokeswoman for Nestle Maggi. Ying was also the spokesperson for Celestial Seasoning. Frequently sought after by the media, Ying has been featured on numerous national television programs, and is regularly profiled in prestigious news media outlets (The New York Times, Washington Post, San Francisco Chronicle, and Huffington Post); and has been named one of the "50 Great Writers You Should Be Reading" by the Author's Show. Ying has contributed to Cooking Light, EatingWell, Self, Men's Health, Christian Science Monitor, and many other prestigious national publications. 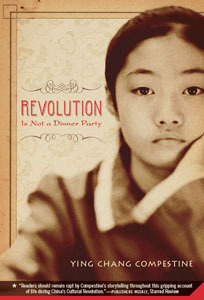 Her keen interest in cuisine has led her to weave food into all of her writing-- including cookbooks, novels, and picture books for young readers.Her highly acclaimed novel about her life growing up in China during the Chinese Cultural Revolution, Revolution Is Not a Dinner Party, has received over 30 national awards, and has been included in school syllabi globally. It was also selected for the One Book/One County reading program in Santa Clara California. To learn more, see Ying's Wikipedia. Perfect for One School, One Book program! Featured on NPR's Morning Edition, The Boston Globe, SF Gate, Mercury News, Epicurious, and Beijing Kids.